Club Paesano’s Concert in the Park, Aug. 4 – Enjoy a Beautiful Summer Evening While Supporting Scuola! Want to support Scuola Italiana and have fun at the same time? 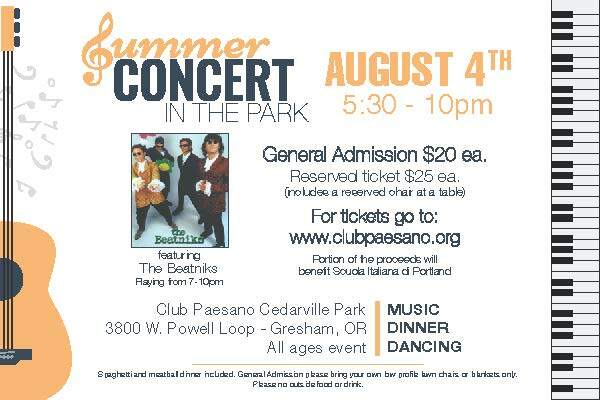 Club Paesano’s Concert in the Park is on August 4, 2018 in Gresham. They will have a benefit raffle and all proceeds from the raffle go to Scuola Italiana, so please go and support the school, while drinking wine on a beautiful summer evening!